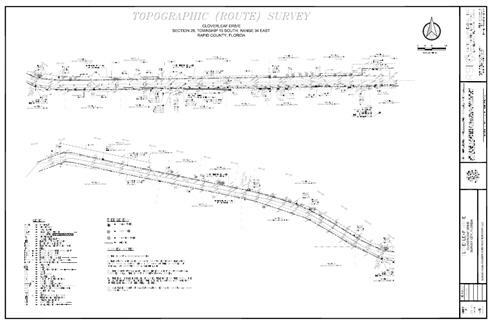 A route survey is a topographic survey of a predetermined existing or proposed corridor. This corridor may be described as a road right of way, utility easement, drainage easement, or a strip of land across a privately owned parcel of land. The route survey is generally used by engineers or designers to determine the best location and/or elevation for utility pipes, drainage features, access, etc. along the “route“. The route/topo survey may show approximate right of way, easement, and boundary lines. The route survey DOES NOT INCLUDE legal and/or exact location of property ownership. If this exact information is also required please see Rapid Surveying’s services page for Boundary survey and Right of Way survey. The route or corridor to be surveyed needs a thorough location description and surveying scope to insure the client is provided with all the necessary survey data to complete the proposed design. Each Route survey is different with its survey requirements. One type includes from apparent right of way to apparent right of way, some will require one side of road way from centerline or partial intersection, and others may need a single elevation profile along a described line across a field. Many times the surveyor will either include too much survey information in the scope of services proposal pricing him out of the contract. Or worse for client, minimizing the scope of services proposal then adding change orders as the client request additional information. Here at Rapid Surveying we will discuss the required scope of survey services with the client and/or engineer. If applicable we will make a field visit to the proposed site. Then we will provide a quote that will cover all foreseen requirements.